They call it the Black Iguana, a premium ready-to-drink wine-based margarita cocktail manufactured in the United States with variants in lime, strawberry flavor, peach, coconut and Pina flavour. 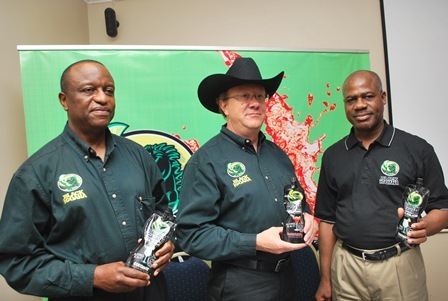 Speaking at a media parley at the Protea Hotel, Ikeja, the President and Founder, DGI Beverages, manufacturers of Black Iguana margaritas, Mr. Earl Castor stated that the brand is a ready-to-drink refreshing beverage that does not require any mixer, blender or concoction. Mr. Castor adds “Unlike other beverages in the market, our trademark, hand contoured pouches allow consumers to drink directly from it without creating any additional clean up. The uniquely designed Black Iguana Margarita pouch is visually stimulating and drives sales among both male and female consumers,” he explained. Black Iguana pouches have re-closable spouts to increase and prolong consumer experience. Consumption can be done straight out of the pouch or poured into glass thus making it very flexible and user-friendly. Before venturing into the Nigerian market, Black Iguana was already being sold in most US states, the UK, South Korea, South America and South Africa, among others.